Management - OCA SFORZESCA S.r.l. 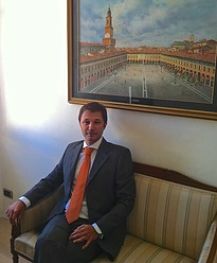 Gianluca Bellazzi is the founder and C.E.O. of Oca Sforzesca S.r.l.. He has a decade of experience in the food industry in medium-sized companies as quality control manager. He has been quality control manager at different stages of the production chain (primary production and processing), process management, research and development management and staff trainer. He is specialized in: Quality control and Quality ensurance, Quality management systems (ISO 9001, BRC, IFS), Environmental systems (ISO 14001), Food safety systems (ISO 22000 and FSSC 22000), and Safety in the workplace ensurance. Also in charge of the religious certifications for both Kosher and Halal. He has spoken at several courses on food processing quality management systems. He holds a degree in Science of Agricolture from the University of Milan (1998), oriented towards the evaluation of the processed products of animal origin. He also held a scholarship at the Institute of Agricultural Industries. Angelo Rusconi is the cofounder and Quality Manager of Oca Sforzesca S.r.l.. He has a decade of experience in food, safety processing and in food microbiology. He is specialized in Quality control and quality ensurance, Quality management systems (ISO 9001, BRC, IFS), Food safety systems (ISO 22000 and FSSC 22000) and Food microbiology (ISO 17025). He has taught several courses on food processing quality management systems and food microbiology. He holds a degree in Food Technology from the University of Milan (1996).